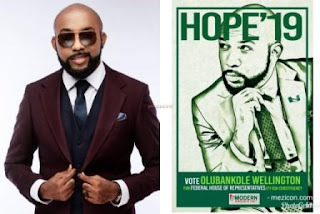 Nigerian singer turned politician, Banky-W has vowed to bring about the real change that is needed in Nigeria if elected as the Eti-Osa House of Representatives member. However, he will be doing this under the umbrella of the Modern Democratic Party (MDP), not the All Progressive Party (APC) who only propagated the change mantra. The Modern Democratic Party (MDP) stated that he was burned with the glorious purpose of restoring lost political values that require restoration in order to get the Nigerian political system functioning again. His first port of call, as proposed by him, would be to drag his fellow leaders into living a life of trust and accountability with their followers. According to him, if fate decides to favor him and he makes it to the House of Representatives as one of the members, he’ll publicly publish his salary and allowances as a legislator and be transparent in spending constituency allocations. He proposed to do this by consulting regularly with the people. Viewing accountability as one of the major problems in the Nigerian political system, he is out to exemplarily bring about a change in that area, if and only if he’s voted in.